How, you ask, do two proud “locavores” – in this instance, Stacey was with her pal, Amy, a talented food writer – order up Quarter Pounder meals with pride and still feel good about themselves afterward? It’s a monthly – or occasionally, a fortnightly – treat. 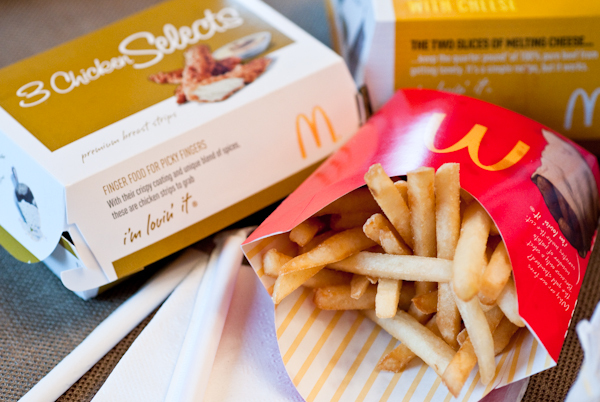 Eating at McDonald’s is not a habit, not an obsession, but a treat enjoyed every so often. We eat fresh, whole foods made from scratch perhaps 80 percent of the time. So a little indulgence is a good thing, because, damn, those fries and burgers make us happy! Including enjoyable foods is such a critical element in eating well. When we deny ourselves what we really want, it’s a lose-lose situation. Eventually we’ll eat what we want, and then we often feel guilty about it afterward. So not worth it. Lose the guilt and know that it’s OK to eat fun foods, even fast foods every so often. It’s all about moderation, folks. Today there’s even a deal online to get Big Macs and fries at a discount. And if you’re a mom, you know how challenging it is to feed the kids – nevermind yourselves! – healthy meals every day. So on a particularly rough day, it’s OK to take a guilt-free drive through the Drive-Thru. Nowadays, it’s even easier to make healthier choices at fast-food restaurants. Opt for milk instead of soda or juice. Choose apples over fries. Take the cheese off the burger. No, wait…that’s a bit too extreme. Keep the cheese. Every food fits because no one food is all good or all bad. Certainly some foods have greater nutritional value and provide more of our required nutrients, but we choose foods based on more than simply nutrition. Stating that every food fits is not discounting the critical role of nutrition to our overall health and well being. Rather, it is expanding the idea of healthy eating to include choosing foods that we truly enjoy, being creative, and finding a balance that suits our lifestyle. It is not, however, permission to eat without awareness. When labeling foods as good or bad, we then carry those biases into our daily eating habits, and lose out on some of the pleasure and enjoyment of food and the overall eating experience. Besides, many know all too well that we set ourselves up for failure when we deprive ourselves. It’s simply not worth it. What do you think? Do you enjoy the occasional fast food treat? Or have *our* monthly burger-and-fry indulgences clouded our thinking? Hi ladies – well . . . . I too am a registered dietitian and I totally agree with the moderation in moderation. 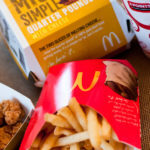 I too used to do the occasional McDonald’s stop but I must say that was years ago now, as my idea of an indulgence no longer crosses my mind with regard to McDonald’s food! While I recently have become a plant-based eater – choosing plant-based foods over animal flesh – this journey has opened my eyes. And as a mother of 2 boys myself I agree with teaching moderation and healthy eating. 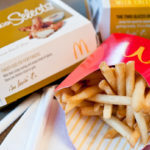 But in my opinion there are other indulgences besides supporting Micky-D’s food production and practices. In the name of the profession, children and people everywhere – a different indulgence may just be the next order to make!